Taras in Calabria, ca. 302 to 281 BC. Silver didrachm. Campano-Tarentine type. RARE. Taras is in Calabria in southern Italy, and is also known as Tarentum. 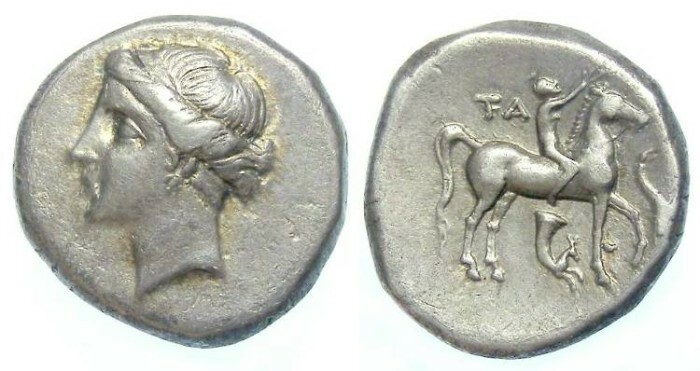 This particular coin is from what is known as the Campano-Tarentin type, because the obverse is based on the coins of Neapolis in Campania, while the reverse is a Taras type, with an ethnic that states the coin was issued from Taras. This suggest that it was struck during a period of alliance between the two cities. A search of the first 500 coins of Taras in coin archieves did not turn up a single one of these, suggesting it must be a fairly rare type. Date : 302 to 281 BC. Size : 18.9 x 19.9 mm, Weight : 7.02 grams. Reference : Sear-366 variety. Vlasto #1031 to 1035. Grade : VF but slightly off-centre. Nice old toning. Obverse : Head of a Nymph left. Reverse : Youth seated on a horse standing right, holding a wreath over the horse's head, with a rhyton below the horse, and a dolphin in front, with TA behind the rider.